Macro Rubio needs to pivot off the nasty attack by Christie and use it to his advantage to get back into the game. Ted Cruz needs to convince voters that he more than anyone else can put together the Reagan coalition of Southern evangelicals, Midwestern Catholics and working class voters, which remains the ticket to winning back the White House. John Kasich needs to find a way to appeal to South Carolina's more conservative electorate, while distinguishing himself from Jeb Bush. Ben Carson must convince voters that he can win. Donald Trump just needs to continue being Donald Trump. In a divided contest, that gives him the advantage he needs to prevail. Jeb Bush must prove that he does indeed understand the times. I doubt he can do it. If he truly can't stomach a Trump nomination, the best thing Jeb could do is get out so the field can begin to coalesce. been the lack of jobs or maybe global warming. Or airborne PTSD. Or aliens. Can't be Islam. Yesterday a man walked into a restaurant named Nazareth, owned by an Israeli Christian. The man asked to speak to the owner, who wasn't there, so he left. About 30 minutes later, he came back, only this time he had a machete. He began attacking the customers, systematically working his way through the restaurant. Thankfully, the patrons fought back with chairs and other items. He fled the scene, and police eventually caught up with him. He was shot and killed when he threatened officers. The coroner's office identified the attacker as Mohamed Barry. Some reports indicate he was a Somali national. Yet a Columbus police officer said, "There's nothing to lead us to believe this is anything more than a random attack." God bless the Columbus police, but seriously. 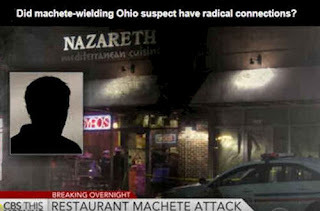 . . Do they see anything in these facts that might lead to a different conclusion about why a Muslim named Mohamed attacked a restaurant named Nazareth, owned by an Israeli? Tags: Gary Bauer, Campaign for Working Families, GOP Debate, Greenville, SC, Mystery, Columbus, OH, Muslim. Mohammed Barry, attack Americans, at restaurant, machete To share or post to your site, click on "Post Link". Please mention / link to the ARRA News Service. and "Like" Facebook Page - Thanks! Bill Smith, ARRA News Service: Former Virginia Gov. 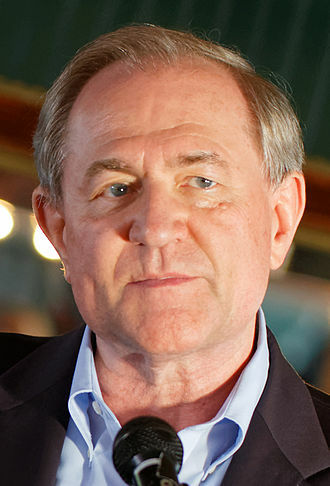 Jim Gilmore announced that he is suspending his campaign for the Republican nomination for President. He announced amoung other places his decision on the Gilmore for President Facebook page.Alexandria, VA -- Former Virginia Gov. Jim Gilmore, the only veteran in the race for the presidency, said today he is suspending his campaign for the White House. Gilmore said he will support the Republican nominee and that he intends to continue speaking out about the dangers of electing either Hillary Clinton or Bernie Sanders. Gilmore, former U.S. Army intelligence agent who has spent the last eight months campaigning for the Republican presidential nomination, said the difficulty of the debate structure combined with the national media coverage of the candidates made it impossible for him to continue his campaign for the presidency. But, he said he is determined to help elect a Republican president. "My campaign was intended to offer the gubernatorial experience, with the track record of a true conservative, experienced in national security, to unite the party. My goal was to focus on the importance of this election as a real turning point, and to emphasize the dangers of continuing on a road that will further undermine America's economy and weaken our national security." "Nonetheless, I will continue to express my concerns about the dangers of electing someone who has pledged to continue Obama's disastrous policies. And, I will continue to do everything I can to ensure that our next President is a free enterprise Republican who will restore our nation to greatness and keep our citizens safe. "Gilmore didn't endorse any of the remaining candidates yet. He said in his statement that he will support the GOP nominee and that he "intends to continue speaking out about the dangers of electing either Hillary Clinton or Bernie Sanders." 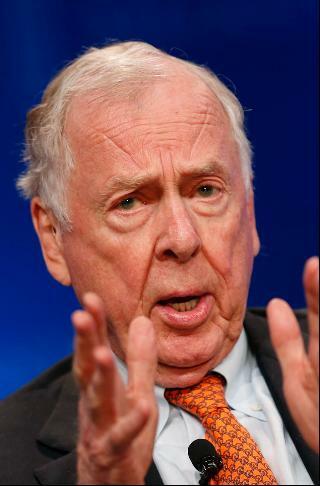 January 18, 2001 – December 5, 2001: Gilmore was Chairman of the Republican National Committee (RNC). Tags: Former Virginia Governor, Jim Gilmore, suspends, 2016, Republican, presidential, campaign To share or post to your site, click on "Post Link". Please mention / link to the ARRA News Service. and "Like" Facebook Page - Thanks! 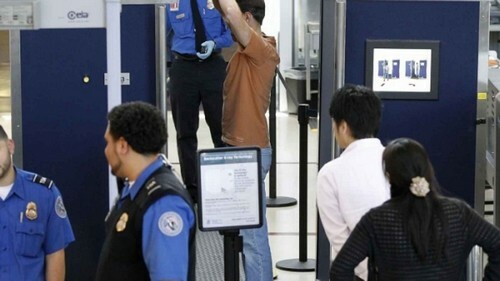 by Michelle Malkin: While a TSA agent pawed my hair bun this weekend, presumably on high alert for improvised explosive bobby pins, I pondered the latest news on the Somalia airplane terror attack. A budget of $7 billion. A workforce of 55,000. Useless explosives-screening “puffing” machines. Unreliable full-body scanners. Thousands of lost and stolen badges and weapons. Unknown numbers of criminals, illegal aliens, impostors and terror operatives with security clearance to do as they please on ramps and runways across America. Tags: Michelle Malkin, commentary, TSA, Total Security Abyss, jihadist, threats, Somalia, airplane, terror attack, illegal immigrants To share or post to your site, click on "Post Link". Please mention / link to the ARRA News Service. and "Like" Facebook Page - Thanks! reveals how screwed we are if she becomes president." by Dustin Howard: It’s just not fair. Bernie Sanders worked hard to beat Hillary Clinton 60 percent to 38 percent in New Hampshire, and she will walk away with more delegates. Why? Democracy is to Democrats what freedom is to socialism: they are mutually exclusive. There is a meme that states that we millennials are supposed to be animated by fairness and equality. It’s half true. First to fairness: we do believe in a sense of fair play. Some among us think that the cold realities of the economy are incompatible with that. One thing that should strike all of us is how the Democrat Party, the name sake of democracy itself, is indeed so afraid of the choice of the people that it has to install apparatchiks with weighted votes to countervail the will of their own voters. Ironic? More ironic still is that Bernie Sanders, Mr. Socialism himself, is the victim of an arbitrary process that systematically deprives an individual of their rightful gains. As to inequality, it’s quite one thing to aspire to wanting more in life. It’s another thing altogether to sacrifice what you have earned for someone else, were that the virtuous outcome. In reality, the democratic socialist ideal is to create a casino society, where everybody plays but few win, and nearly all walk away with much less. The winners in this society will ultimately be the house itself, as any other winner will be deprived of their gains as surely as Bernie sits tied with Hillary because super-delegates negate his double-digit drubbing of the queen in waiting. I urge my fellow millennials: keep striving for equality of opportunity and fair play. Just don’t expect the government to be any better than any other casino, where the house always comes out on top. 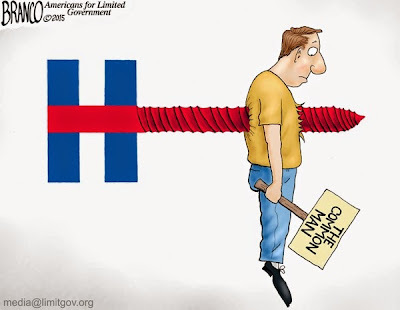 Tags: DNC, redistributes, Bernie Sanders delegates, delegates, Hillary Clinton, New Hampshire Primary, editorial cartoon, AF Branco, Dustin Howard, Americans for Limited GovernmentTo share or post to your site, click on "Post Link". Please mention / link to the ARRA News Service. and "Like" Facebook Page - Thanks! by Paul Jacob, Contributing Author: Progressives are becoming increasingly defensive about nearly all forms of Big Government, relentlessly telling us that we need government for everything from money and roads to food inspection and subsidies and . . . well, the list is endless. Food safety is one of their favorite subjects, but I'm increasingly skeptical. 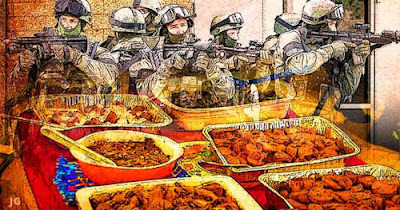 Do we really need to be protected from our neighbors' produce and cooked goods, as can be found in community bake sales and potlucks? In Arizona, legislators had long carved out an exemption from commercial food safety regulations for potluck and similar "noncommercial social events." Great. 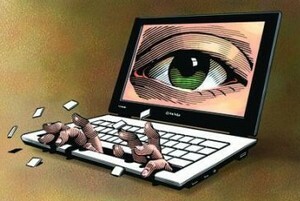 But there was an unfortunate limitation to the exemption: it applied only to such events that took place at a workplace. Home or church? Potlucks there are still against the law. So of course officials took the occasion of said "loophole" to crack down on some neighborly events in an Apache Junction mobile home park, in Pinal County. I'm sure hundreds, perhaps thousands of these events are routinely ignored by Arizona's police. 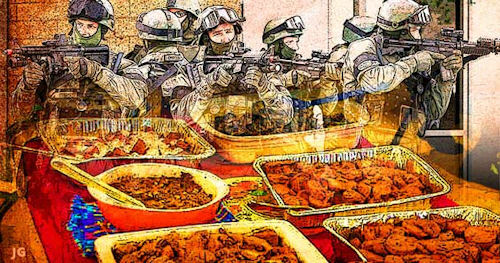 Indeed, I bet half of the state's better cops engage in such activities themselves -- just because potlucks are part of everyday life all over the country. But the idiotic regulation allowed public servants (loosely so called) discretionary powers to attack a few people for reasons tangential to community safety. Thankfully, Rep. Kelly Townsend has introduced HB 2341, which would extend potluck freedom beyond the office or warehouse workplace. Let us be clear: this was not a problem waiting to be solved by Big Government. It is a Big Government problem to be solved by new legislation to de-regulate home and community potlucks. Tags: Paul Jacob, Common Sense, Arizona, big government, potluck rites, rights, Rep. Kelly Townsend, HB 2341 To share or post to your site, click on "Post Link". Please mention / link to the ARRA News Service. and "Like" Facebook Page - Thanks! 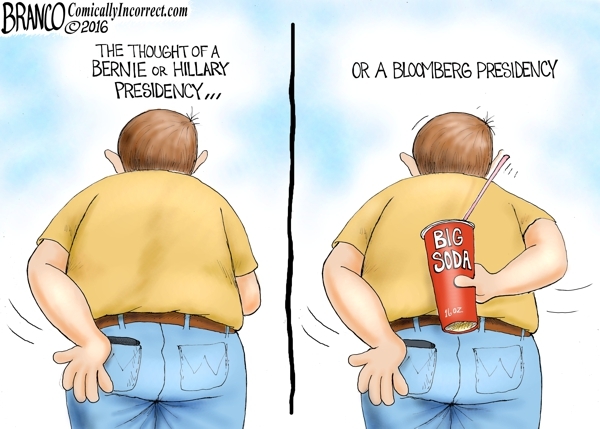 Negative Thinking . . .
. . . Nanny President – Hold on to your Big Gulp folks, A Nanny Bloomberg Presidency could be just as bad as a Hillary or Bernie presidency. Tags: negative thinking nanny president, big gulp folks, Bloomber, Sanders, Hillary, editorial cartoon, Tony Branco To share or post to your site, click on "Post Link". Please mention / link to the ARRA News Service. and "Like" Facebook Page - Thanks! 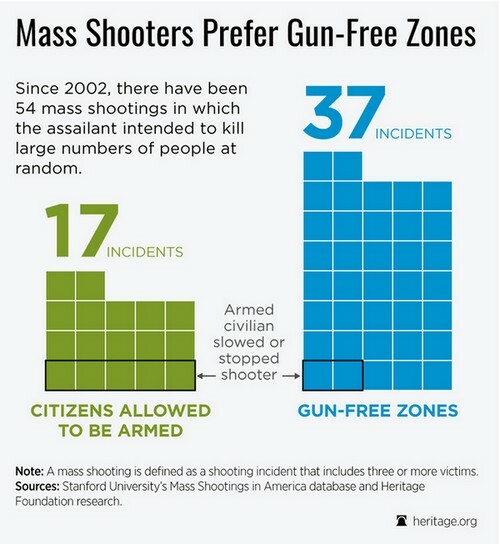 by Patrick Tyrrell: An analysis of mass shootings in the United States since the year 2002 shows that gun-wielding mass killers are more likely to strike where the Second Amendment right to bear arms has been supplanted by “gun-free zone” ordinances, be they federal, local, or specified by the owner of the property. The Stanford University Libraries’ dataset of mass shootings (“Stanford Mass Shootings in America, courtesy of the Stanford Geospatial Center and Stanford Libraries”) was analyzed for mass shootings over the past 14 years. The definition of a mass shooting for the Stanford database is three or more shooting victims injured or killed, not including the shooter. Shootings that are gang- or drug-related are not included. If you have a choice to be in a gun-free zone or a legal-to-carry setting, you are less likely to be the victim of a mass shooting where it is legal to carry guns. All else being equal, if a killer can strike where he is less likely to face lethal law-abiding resistance from ordinary citizens, he will. 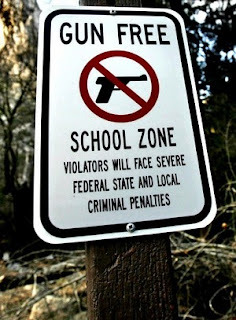 Tags: mass shooters, prefer, gun-free zones, schools, The Heritage Foundation, research, Patrick Tyrrell To share or post to your site, click on "Post Link". Please mention / link to the ARRA News Service. and "Like" Facebook Page - Thanks! by Rakesh Upadhyay : The Obama administration's proposed $10.25 per barrel oil tax adds up to approximately $32 billion a year, and critics are coming out of the woodwork in defense of both the oil industry and end users who would foot the bill for transportation system reforms - but it may be a moot point since the effort will simply be killed off by Congress. Federal gas taxes have not been raised since 1993, and with gas prices at an all-time low, such a proposal will be fairly easy to justify at the pump, and is unlikely to cause much of a fuss for end users. Consumers would pay an additional 22-25 cents per gallon of gas — with the final price still well under gas prices a year or two ago. Rakesh Upadhyay authored this article contributed by James Stafford the editor of OilPrice.com, the leading online energy news site, to the ARRA News Service. Tags: T. Boone Pickens, Obama Oil Tax, Dumbest Idea Ever, James Stafford, Rakesh Upadhyay, Oilprice.com To share or post to your site, click on "Post Link". Please mention / link to the ARRA News Service. and "Like" Facebook Page - Thanks! 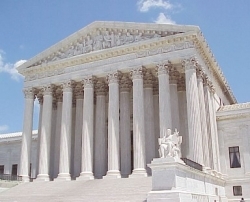 by Sean Hackbarth, Contributing Author: The Supreme Court granted a stay of EPA’s carbon regulations—theClean Power Plan. The Wall Street Journal editorial board called it an "important rebuke to the political method of the anticarbon activists in the EPA and White House. "Ditching fossils fuels will be a capital-intensive and generation-long transition, to the extent it is possible, and states must submit compliance plans as soon as this September that are supposed to last through 2030, or be subject to a federal takeover. The legal challenges will take years, but the EPA hopes to engineer a fait accompli by bullrushing the states into making permanent revisions immediately. Once the Clean Power Plan starts, it becomes self-executing. If the EPA loses down the road, it will laugh that the opinion is too late and thus pointless. ... The stay suggests that a majority of the Court won’t allow this deliberate gaming of the slow pace of the legal process to become de facto immunity for anything the EPA favors. It’s especially notable because courts tend to be highly deferential to executive regulation.What exactly did the court do? Why did the court do this? And why have states, businesses, labor unions, and trade associations — including the U.S. Chamber — welcomed this decision as they fight EPA’s regulatory overreach? I spoke with Heath Knakmuhs, senior director of policy at the Institute for 21st Century Energy to get some answers. And to understand the international implications of the Supreme Court's stay, read Stephen Eule's piece. Tags: Sean Hackbarth, Chamber of Commerce, Supreme Court, pause, EPA's Carbon regulations, Heath Knakmuhs To share or post to your site, click on "Post Link". Please mention / link to the ARRA News Service. and "Like" Facebook Page - Thanks! by Kerby Anderson, Contributing Author: Over the last few weeks, Nebraska senator Ben Sasse has been using Twitter to ask presidential candidate Donald Trump some pointed questions. After about a week of these, Trump decided to answer with a short insult rather than address some of the important constitutional questions. This led to an interview Chuck Todd on MSNBC did with Ben Sasse in which he asked him to define conservatism. The Senator’s short answer has gone viral because it is succinct and profound. 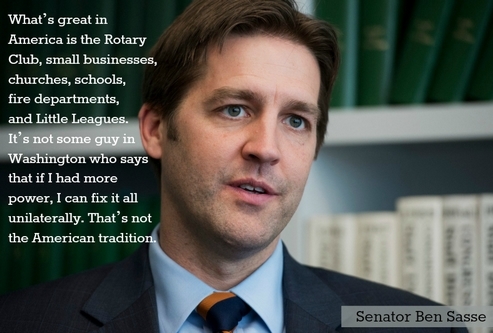 Senator Ben Sasse isn’t the only person calling for America to return to its constitutional foundation. But he has become one of the most articulate voices doing so. Tags: Kerby Anderson, Viewpoints, Point of View, U.S. Senator, Ben Sasse, Conservatism To share or post to your site, click on "Post Link". Please mention / link to the ARRA News Service. and "Like" Facebook Page - Thanks! by Phil Kerpen, Contributing Author: The Senate has voted 75 to 20 to pass S.431 - Internet Tax Freedom Forever Act which permanently bans state and local governments from taxing Internet access. You collectively sent over 31,000 letters supporting the bill and I cannot thank you enough. President Obama is expected to sign it. Of note, the same three Republicans who stalled this vote for months to hold it hostage to their desire to apply sales tax to online purchases actually voted no. They were Lamar Alexander of Tennessee, Mike Enzi of Wyoming, and Mike Rounds of South Dakota. They voted, in effect, to allow state and local governments to slap taxes on your home and mobile Internet bills that would average 12 percent. That's something zero Republicans should support. But even with their spiteful no votes and the seventeen Democrats who also voted no, the bill passed easily. That's a big deal in a town where it's been very, very difficult to deliver any good news for taxpayers, and you helped make it possible. By voting to permanently ban internet access taxes, Congress has ensured that Americans all around the country can have access to broadband internet without a fear of burdensome prices. Tags: Phil Kerpen, American Commitment, Senate Bans, Internet, access tax To share or post to your site, click on "Post Link". Please mention / link to the ARRA News Service. and "Like" Facebook Page - Thanks! "Marco Rubio and Ted Cruz agree that President Obama's political bureaucrats at the Department of Housing and Urban Development have no business overriding local zoning authority to impose their radical vision on America. "Under HUD's AFFH regulation, the federal government is imposing its will by conditioning the acceptance of $3.3 billion of annual community development block grants on 1,200 local governments being forced to acquiesce to rezone cities and counties along racial and income fairness guidelines. Local zoning only determines what can be built where, not who can live there, which is subject to market conditions including demand, location and availability. This has nothing to do with real housing discrimination, which has been illegal for almost 50 years, it is about nationalizing neighborhoods, giving the federal government the power to determine where people live and what will be built where. This may be Obama's most far-reaching regulation yet, and that is why the Senate must stop it. "There should not be a single Republican in the Senate opposed to the Lee, Rubio, Cruz bill that stops implementation of this radical rulemaking. HUD overreach is already impacting Dubuque, Iowa and Westchester County, N.Y. and this is only the beginning. The Senate needs to hold hearings, and join the House in passing an appropriations rider that stops Obama in the short-term. Additionally, the Lee, Rubio, Cruz legislation should be brought up for a vote and passed. Every Republican Senator still running for president agrees with Mike Lee on this issue, making this a national issue worthy of every senator's immediate attention. "This is not a joke, it affects property owners in every senator's respective states. Now is the time to take a stand, before the HUD racial and income rezoning regulation becomes a permanent weapon of mass destruction in the federal government's arsenal against cities and counties. "The House of Representatives, led by Representative Paul Gosar has passed defunding amendments of the Obamazone regulation in the HUD appropriations bill each of the past two years, and now it is time for the Senate to get on board and force an end to this noxious federal government overreach at once." Americans for Limited Government is a non-partisan, nationwide network committed to advancing free market reforms, private property rights and core American liberties. Tags:Americans for Limited Government, Robert Romano, Rick Manning, support, S. 1909, Local Zoning Decisions Protection Act of 2015, U.S. Senators, stop, HUD, radical zoning quotas To share or post to your site, click on "Post Link". Please mention / link to the ARRA News Service. and "Like" Facebook Page - Thanks! by Paul Jacob, Contributing Author: On February 28, the Academy of Motion Picture Arts and Sciences (AMPAS) will announce the winners of its annual movie awards. Many Americans watch this Academy Awards show as a rite, treating the “The Oscars” as if it were a big deal. It certainly isn’t immune to controversy. This year, a cry went up under the banner “#OscarsSoWhite.” Unlike in the recent past, no black actors or directors were nominated in the big categories. Charges of racism flew fast and wild. AMPAS is a large but private membership organization, and its membership is overwhelmingly white. So one could “explain” the nomination list entirely on racial grounds. 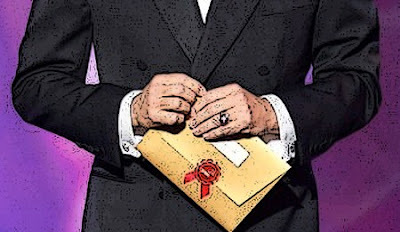 But it’s not as if the organization doesn’t try to be fair: the voting process, for the final awards, is nothing as crude as America’s bizarre system, which combines first-past-the-post vote counting and selection by the Electoral College. AMPAS uses a form of ranked choice voting, instead. “Since 2009, the Academy has used instant runoff voting to determine the winner of the coveted Best Picture award,” explains Molly Rockett at Oscar Votes 1-2-3. The Academy has an interest in ensuring that winners at least enjoy majority support, so the selection process measures overall support, not picking the winner merely by a small plurality of first place votes in a crowded field. Ms. Rockett tells us that the Academy is trying to racially diversify its membership. Maybe that will change something. Or maybe nothing needs to be changed — it’s not as if the Oscar nominees should be selected by racial quota. But it is worth remembering that the Oscars sport a more rational democracy than the United States. Tags: Paul Jacob, Common Sense, Academy, Academy of Motion Picture Arts and Sciences To share or post to your site, click on "Post Link". Please mention / link to the ARRA News Service. and "Like" Facebook Page - Thanks! 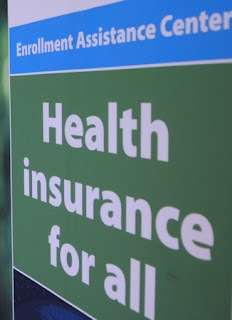 by Leah Jessen: The government granted up to $750 million in Obamacare tax credits to 500,000 persons who weren’t eligible, many of whom may have been illegal immigrants, a Senate report says. Half a million individuals mistakenly received the tax credits because of a lapse in verification of their legal status and a lack of coordination among government agencies, the report determined. Although they failed to verify citizenship or their legal status, they got the “advanced premium” tax credits under the Affordable Care Act. The taxpayer dollars are awarded on the basis of income to help lower premium costs on Obamacare’s marketplace insurance exchanges. The Centers for Medicare and Medicaid Services, part of the Department of Health and Human Services, oversees Obamacare. The report, conducted by the Republican staff for Johnson’s committee, says the agency was responsible for distributing credits and subsidies to insurers on behalf of individuals. The Internal Revenue Service was responsible for reconciling the amount with what individuals are entitled to receive. In this “pay and chase” model used to pay and recoup funds, the Department of the Treasury “pays a portion of an enrollee’s premium without confirming whether the enrollee is eligible for such a payment, and then ‘chases’ after the enrollee to recover the payment if is later determined that the enrollee was ineligible,” the report states. In 2014, the exchanges paid out approximately $15.5 billion in advanced premium tax credits to an estimated 4.5 million taxpayers. The IRS estimates that only 10 percent of taxpayers—300,000 individuals—received the correct amount of advanced premium tax credit, and that approximately 50 percent of taxpayers—1.6 million individuals—received excess credit.Last March, Johnson asked Health and Human Services Secretary Sylvia Burwell about the processes for eligibility verification and recouping of improper payments. He also wrote to the IRS. Republican staff calculated the findings based on data provided by the agencies as of last June. CMS confirmed to Fox News Channel that 471,000 customers with Obamacare coverage last year failed to prove legal status. “Lack of verification does not mean an individual is ineligible for financial assistance, but only that a marketplace did not receive sufficient information to verify eligibility in the time period outlined in the law,” agency spokesman Aaron Albright told Fox. To test the accuracy of the verification process for the Obamacare insurance exchanges, the Government Accountability Office submitted applications from 12 phony applicants, over the phone and online, during the first enrollment period from October 2013 to April 2014. For seven of the 11 successful applicants, GAO did not submit all required verification documentation, but the exchanges nonetheless provided subsidized coverage. The exchanges automatically re-enrolled all 11 fictitious enrollees for 2015 coverage. Eventually, the exchanges terminated coverage for six of the enrollees based on failure to provide documentation of eligibility. However, for five of the six terminations, GAO obtained coverage reinstatement and increases in advanced premium tax credit amounts.In January, President Barack Obama vetoed a bill that would have repealed much of Obamacare. The House failed to override the veto. Tags: Billion, Obamacare, Tax Credits, Illegal Immigrants, Leah Jensen, The Daily Signal To share or post to your site, click on "Post Link". Please mention / link to the ARRA News Service. and "Like" Facebook Page - Thanks! by Skip Murphy: Yup, those jolly jesters of the “poke them in their political eyes” genre of investigative journalism have done it again. Here. In New Hampshire. During the First In the Nation Primary. Did I mention “Again”? Yep, James O’Keefe and his compatriots are showing us, once again, that the “thing that cannot happen here in NH” actually can be done thanks to clueless (or better put, hyper-partisan) election officials more excited about helping “their side” than protecting The Rule of Law. Take a gander: Four years ago, James O’Keefe "released a video which showed how easy it would be for people to vote in New Hampshire using the names of deceased people. As a result of that video, New Hampshire changed its voter ID laws. Project Veritas Action (PVA) revisited New Hampshire during Tuesday’s presidential primary election and again showed how easy it is to cast fraudulent votes with the new law fully in place. In this new video, multiple election officials and Bernie Sanders presidential campaign staffers offered advice to journalists using hidden cameras about how to circumvent the law. Skip Murphy is Co-founder of GraniteGrok. He is a New Hampshire TEA Party activist, citizen journalist (and pundit! )advancing Individual Liberty and Freedom. His goal is using New Media to advance the radical notions of America's Founders back into our culture again. 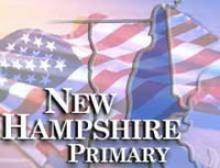 Tags: Skip Murphy, GraniteGrok, Project Veritas, investigates, voter fraud, New Hampshire, 2016 Primary To share or post to your site, click on "Post Link". Please mention / link to the ARRA News Service. and "Like" Facebook Page - Thanks!